You Have Eevolved Into Flareon! Flareon is the eeveelution of courage. It doesn’t back down and uses its fiery intellect to conquer and understand the challenges around it. By getting Flareon, it shows that you are brave and precise. You don’t take a brutish approach to difficult situations, as your physical strength is not your main tool – instead, you try to decipher and deal with things mindfully. In the same way that a trainer enjoys their Flareon at all times, you are also an always-welcome companion. You are quick-witted in conversation and pride yourself on your attention to detail. At social gatherings, you like to talk one-on-one over mingling with everyone – and you have the best stories to share. You take a burning approach to life and are highly unique. Flareon is a flame-based creature that has the ability to store air in its internal flame sac. Here, inhaled air is turned into the powerful burning concoction it spits out. It is a quadruped Pokémon, which means that it gets around on all fours. For agility’s sake, Flareon may temporarily become bipedal, which means it stands on its hind legs — but using four allows Flareon to utilize its speed in dodging and avoiding the bigger Pokémon it might face. It has three small toes on each foot and a bright yellow paw pad (the underneath portion of its paws). Flareon has very long ears and incredibly dark eyes, as well as a cute little black nose. The length of its body is covered by an orange-reddish fur. The tail and the collar of this Pokémon are a bit different — much lighter with a yellow tint. 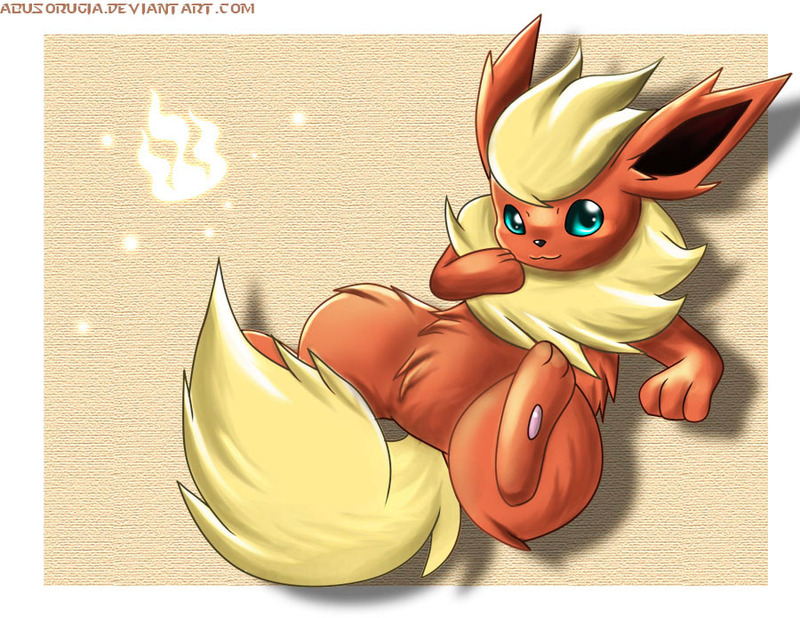 All of the colors of Flareon are made to reflect its fiery nature; it is a formidable fire-type contender. The real life inspiration for Flareon seems to be either a fox or a Pomeranian dog. Flareon is a Pokémon that is very rare in the wild; odds are you’ll only be able to spot one in within a city or in tournaments. You can’t count on catching one by searching, and will probably have to evolve one yourself. The process of evolving to a Flareon can be a tricky task if you’re not aware of the recipe – but once you have the formula down, it should be a piece of cake! Simply expose your Eevee to a fire stone and an eeveelution occurs. One you have your very own Flareon, you can go on to teach it an abundance of moves. They are very loyal to their trainers. In the Pokémon world, Flareon is first-generation and inasmuch has a ton of rich history and features. In the anime, Egan, a fire trainer, had a Flareon that he used used it to capture a Magcargo. Ash has had to face Flareon foes on multiple occasions — but the most memorable event was when one stood between him and the hailed Pokémon League Entrance! Ursula, a recurring trainer in the newer Pokémon anime episodes, had a Flareon that was evolved from a prized Eeevee. A Pokémon Coordinator known as Savannah had a Flareon with which she entered into the Rustboro City Contest (this is the contest where you pit Pokémon against each other to compare looks, charm, and many other useful traits). Naturally, Flareon did well on all fronts. In the Pokémon games, Flareon has the highest Special Defense base stat of any Fire-type Pokémon that is not a legendary. It is a popular choice for any trainer!